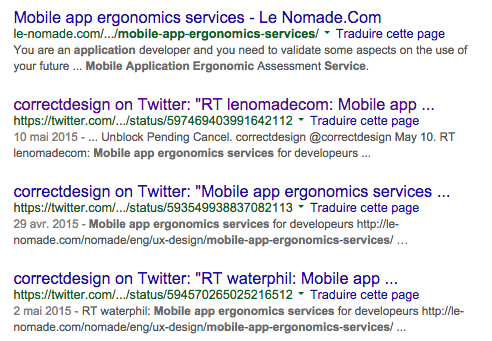 Since a few month in 2015, Google announced that tweets will be back in search results and this a real example. We get this result below and note that the first link is the official web page related to the RT. After that, you can see retweets from a follower. We can assume that Google decided to give more importance to RT than to real and original tweet. We will continue to monitor this to analyse the positive and negative aspects of all this and see the potential for SEO and Marketing. And you, what do you think about it?